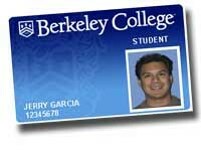 Your Berkeley College Student ID is the 8-Digit number on the FRONT of your Berkeley College ID. You can also find this number from the Student Self-Service portal. Click on the "Student Self-Service" tile. Log into self-service with your Berkeley user name and password. At the bottom, under "Personal Information", click on "Demographic Data". On the next page that opens, you will see your ID number as the first bolded number on the page. If you have questions about your ID information, you can speak with Student Development and Campus Life.